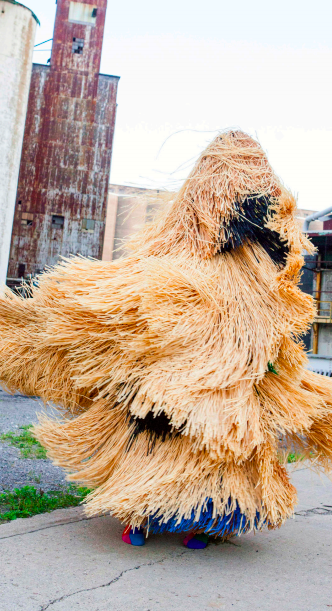 Led by acclaimed international artist Nick Cave, PLENTY is the multi-arts, multi-generational collaborative art-making experience teaming schools, neighborhood organizations, cultural groups, local artists, and families with the goal of creating new pathways toward a more equitable Buffalo. Inspired by the process of planning Nick Caves’s PLENTY, a reading and discussion program was created. Plenty will weave together the rich cultural traditions found in Buffalo – African-American, Burmese, German, Indian, Iraqi, Irish, Native-American, Hispanic, Polish, Somalian, Sudanese, and Ukrainian, among others – with the magic, wonderment and creative experimentation of artist Nick Cave, who uses a city as a canvas to inspire cross-neighborhood, cross-cultural dialogues. Community groups, Buffalo school students, organizations and artists from across Buffalo will work side-by-side to create floats, dance mash-ups and performances beginning in fall 2019. The collaborative works will result in public performances at city parks, in spring 2020. Plenty will culminate in a parade, performance and celebration at Silo City in Summer/Early Sept 2020. This project is currently moving into the community organizing and fund development phase necessary to execute a project this democratic and expansive in nature. Plenty will be Cave’s largest community interaction to date. His acclaimed Here Hear collaboration took place in Detroit in 2015. Organized by the Cranbook Art Museum, Here Hear allowed the city to “hear” itself across barriers of race, class, and access. Nick Cave Uses His Capital to Help Aspiring Artists, New York Times, November 2018. PBS short interview/documentary with Nick and community, and views of his studio. 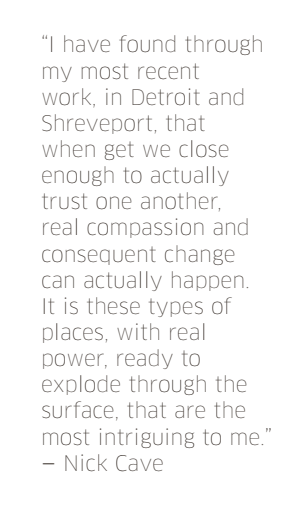 AS IS, documentary by director Evan Falbaum on Nick Cave's 12-month collaboration in Shreveport, Louisiana with five social service organizations. Nick Cave Gets Personal about Race and Gun Violence, New York Times. The Sunshine Eaters, a group exhibition in Toronto at OCAD University. On view January 10 - April 15, 2018. Feat., an installation at The Frist Center for the Visual Arts in Nashville. On view November 10, 2017 - June 24, 2018. The Let Go, an installation at Park Avenue Armory in New York City. On view June 7 - July 1, 2018. Nick Cave is one of the most celebrated artists working today, garnering deep appreciation by the public, media, and major art institutions. Trained as a dancer and a fine artist, Cave has a magnificent ability to blend fashion, craft, performance, sculpture and public engagement. He is renowned for his wearable sculptures called Soundsuits, which Cave first created in the aftermath of the Rodney King beatings in Los Angeles (1991), envisioning an emotional shield that protects one’s race and gender while still expressing individuality. Built from found materials (beaded dresses, twigs, buttons, antique knick-knacks, and toys), these wearable collages create a place to dream the old into a new vision. Cave has created immersive, public installations and events in New York City (Grand Central Station, 2013 – HEARD NY) Shreveport, Louisiana (AS IS, 2016) and Detroit (Here Hear, 2015). In October 2016, the public will experience his immersive installation, UNTIL, at MASS MoCA in North Adams, Massachusetts. Cave’s work is in the collections of Crystal Bridges; Hirshhorn, MOMA, NY; MFA, Boston; Smithsonian, among others. Cave has received several prestigious awards including: Joan Mitchell Foundation (2008), Creative Capital (2002, 2004, 2005). He is Professor and Chairman of the Fashion Department at School of the Art Institute of Chicago. Cave is represented by Jack Shainman Gallery. Sean Mulligan, Senior Legislative Assistant, Office of David Rivera, Majority Leader, Buffalo Common Council.